In the 30th century BC, the Babylonians learned to predict eclipses, camels were domesticated by the Arabs, Mesopotamians created the plow, and the art of yoga was founded in India. According to Merriam-Webster the shortest definition of yoga is “a system of exercises for attaining bodily or mental control and well-being”. Yoga is not about being able to get into and hold impossible positions, but the journey and discipline in attaining unity with the self and the world around the self to hold those scary positions. Yoga allows for any skill level; to participate and benefit, however, the mind must be involved as well, in order to hone the chi, or energy. T0 those for whom “prana” is not an inspiring base of a healthy lifestyle, there is the Force. For these people Matthew Iatkiewicz has found a way to channel the Star Wars universe and “get those midi-chlorians flowing!” Channeling an AT-AT, R2-D2 or even an enraged Wookiee is a great way to “become one with the Force”. In this video (for those who are at work or class or somewhere else where you aren't supposed to be goofing off) Iatkiewicz demonstrates some of the poses found in Star Wars Yoga. 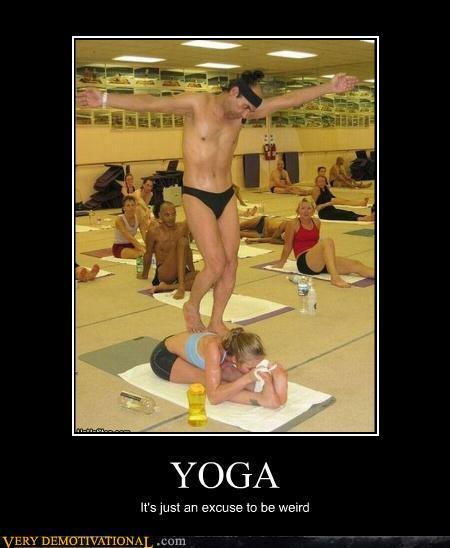 These poses, at least those he demonstrates are simple and/or modified positions found in traditional yoga. For example, Darth Vader breathing resembles the deep breathing meditative pattern by forcing you to breathe correctly (in the stomach, not the chest) by making the Hooooo-Krrrrr sound. Also, the collapsed AT-AT is somewhat like the child's pose, or resting position where the trunk of the body is stretched out and resting on the ground. And not to mention the saber one pose resembles a twisted "hero" pose, the "hero" or saber sets seem like they would be a lot more inspiring with a prop lightsaber, or cardboard tube, on hand. "Through (blank) I become one with the Force." “The Force” in the Star Wars universe is the energy created by all living things which binds the universe together. This is the belief of Star Wars yogis and those who belong to the Jedi religion. Yes, you read correctly, J-E-D-I Religion! The beliefs of both are that the Force is what binds all living things in the universe together, and to not cause suffering, and to only practice the light side of the Force. As a side note, could you imagine having people coming to your door in robes asking if they can test you for midi-chlorians? Neither can I, that would be awkward. Regardless, the Force, like many other interests, is what binds several communities together; whether they are for moral values, entertainment, or even exercise. So, while channeling the core power of a Tie Fighter, or even the Reclining Jabba, remember, the Force will be with you, always.